First off…what is home automation? To put it simply, it’s the concept that all of your devices and systems can be integrated to provide you with easy control over all aspects of your home under one platform. With home automation, you can program how and when it should react. You have the power to set your system on a schedule based off of your personal preferences. Once you do that, the rest is easy. Sit back, relax, and watch technology do its thing. There’s also much more a home automation system can do to help benefit your every-day life. At any time, you can grab your smart phone or another device and can change the settings for your home system as desired. Whether you’re home or on some trip one-hundred miles away, you are able to control and automate just about everything. What’s it good for, you ask? You thought you would need a system like the “Clapper” to turn lights on and off from the comfort of your own couch, right? Wrong! With a home automation system, you will be able to turn lights on, off, or dim and brighten them with the touch of a button from the same remote you would use to control the TV. Kick back, relax, and don’t move a muscle besides the one in your finger controlling the remote. You could even use a singular, universal home controller that will let you adjust the temperature of a particular room in the house, and let you amp up or lower the volume of your surround sound located on the other side of the house with the same device. Now imagine a cold, winter morning. Your alarm clock calls you and you have to awaken from your cozy blanket cocoon to get ready for work. How nice would it be to walk into a bathroom already warmed up for you? You can program a home automation system to turn on the heat in your bathroom automatically just minutes before your alarm wakes you up. No longer will you get the morning shivers. Perhaps you want to watch a movie on a lazy Sunday afternoon, and in the middle of the movie the sun angles itself to shine right through your window causing a glare on the screen. Who wants to deal with the hassle of pausing the movie, getting up and closing your shades manually? We can make your home feel like nighttime with the touch of a button. A home automation system gives you the ability to close blinds from the comfort of your couch. No interruption to your movie is necessary (unless it’s a break to get some snacks, of course). 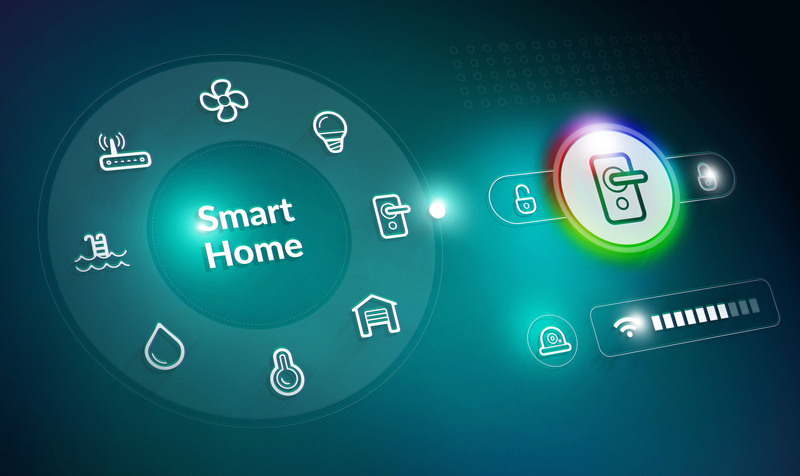 Oh…and many smart products such as home automation systems also save energy, thus helping you save money in the long run…how much more convenient can it get? Although dimming lights and heated bathrooms can seem like a necessity, we also can’t forget to mention that home automation systems also provide security for your home. Whether it be security cameras, a carbon monoxide detector, a water leak or temperature sensor, a home automation system keeps a watchful eye on your property so you can act when you need to – ASAP! You can also feel safe coming home when it’s already dark outside. Using products such as a motion sensors, you are able to light up your house when someone is nearby. Home automation can also be programed to have your security system call your central station if an alarm is triggered. For example, if you are out of the house you can be notified when there is a water leak or if there is unexpected entry (more commonly thought of an unwelcome guest) from a window or an entry door. Last on our list, but certainly not least, it’s FUN! Well just like a smartphone, tablet, gaming console, or any other piece of technology, you’re getting involved. With a home automation system, you are able to select personal preferences and actions. Think of it as a real-life computer game…your choices, your decisions, your life. We won’t lie to you, at first it could seem complicated. So many buttons, so many decisions and preferences. But don’t fret, this technology is quick to learn all while being super flexible and user friendly. You will end up having fun choosing your preferences. There’s something to say about having a little fun by switching off lights upstairs while you’re downstairs. Maybe have a laugh “pranking” your family by playing some music when the house is quiet. (You didn’t get that idea from us). You can also play “peek-a-boo” by viewing visitors at your front door, or you can program a controller to understand your voice while issuing a command. Have some fun all while enjoying the convenience and extra safety a home automation system provides you and your family. Get ready to indulge in a lifestyle that 2018 and beyond has to offer. Let us help you bring that smile to your face with the latest and greatest in home automation!